Beautiful 5 star hotel overlooking the sea, formerly a luxury XVIII century villa with incredibly rich interiors. 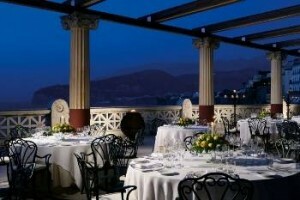 The position is stunning; from this resort you can enjoy a wonderful panorama of Naples gulf and the Vesuvius volcano. This romantic hotel offers impeccable services with its three gourmet restaurants, the private beach, the spa for health and beauty treatments. Perfect setting for a quiet romantic wedding on the Amalfi coast where the newlyweds can also enjoy a fantastic holiday in one of the hotel’s superb suites.